Is the Out Of Body experience Myth or Reality? For thousands of years in the myth and folklore of most races around the world, stories and beliefs of the out of body experience, or (OBE), have proliferated. In today’s world of “civilized society” and science, people who take this phenomenon seriously, for the most part and outwardly, are looked on as, to say the least, eccentric. But I suspect that the majority of people, at least find the subject interesting and have a secret open mind. 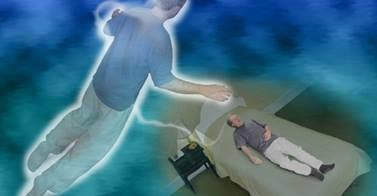 If you believe that an out of body experience or a near death experience (NDE) is possible, then other subjects such as Astral Travel, Life After Death and Reincarnation must come into play as well. I for one, having researched the subjects extensively for my books, believe that these phenomena are all part of the same process, and at least possible, if not probable. There are millions of people who believe they have experience an out of body experience, and many who claim to Astral Travel at will, and are willing to show you how for a price. However one particular group caught my attention and I believe they are worth a look. so I have embedded some video of a recent conference, featuring Luis Minero, a well known lecturer and author on the phenomenon and an exponent of Astral Travel. He is very convincing and explains himself well. see what you make of it.